Xbox 360 and PS3 owners may have to wait even longer for a chance to play Mortal Kombat X. A new report suggests that the last-gen versions of the fighting game won't arrive by June as planned. Kotaku, citing numerous employees of GameStop, says that Mortal Kombat X's PS3 and Xbox 360 versions have been delayed to the fall. The retailer is reportedly telling pre-order customers now that they've delayed the game. As Kotaku points out, GameStop's website now lists the Xbox 360 and PS3 release dates as "12/31/2015." They're not actually expecting the game to debut on New Year's Eve. Instead, that date's a short way of saying, "We have no idea what the release date is but we're expecting it to be out by the end of the year." This is the second major delay to the PS3 and Xbox 360 editions of the fighting game. Back in March, Warner Bros. announced that the last-gen MKX wouldn't be out until June. Initially these versions were supposed to have the same April release date as their Xbox One, PS4, and PC counterparts. Warner Bros. hasn't explained either delay. Is the development team having trouble converting the game to older hardware? Does WB think that MKX's last-gen versions will sell better during the holiday season than during the summer?Or are they simply making sure that the focus stays on the newer, shiner versions of the game while they're still selling well? 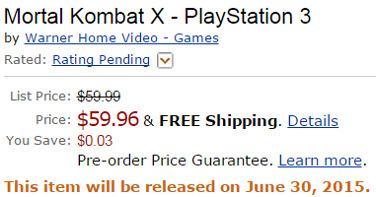 Even without the PS3 and Xbox 360 versions in stores, MKX is still selling well. The game topped the NPD charts for April. It may do the same in May or at the very least end up right behind The Witcher 3. MKX's commercial success thus far means that Warner Bros. isn't any under pressure to release those other ports. They can take their time and release it whenever they please. Hopefully this latest delay helps ensure that the 360 and PS3 versions end up being respectable ports of the original game.